Did you ever wonder what worship in the Temple of the New Jerusalem might sound like after all the nations of the earth come together? (Besides being loud and following the Book of Common Prayer.) Imagine the saints of every nation, tribe and tongue singing together Holy, Holy, Holy, each in their own language. Our worship services at General Convention have moments that approach such glorious cacophony. Of course, people of every nation, tribe, and tongue have not joined us in Salt Lake City, but many more have than we generally find in any one congregation on Sunday morning. The largest Diocese in the Episcopal Church is Haiti, where Haitian Creole is most people’s first language, and many Episcopalians in the United States, as well as in Honduras, Ecuador, Columbia, Venezuela and the Dominican Republic, speak Spanish. A variety of Native American languages are spoken by Episcopalians, and the Episcopal Church has congregations in Italy, France, Germany, Switzerland, Austria and Belgium. A new church plant in the United States has formed among Hmong speakers (a Southeast Asian language), and that congregations recently raised up the first Hmong Episcopal priest. Over the course of Convention, many of those languages will be incorporated in some way into our Worship services. Spanish was the second language used in today’s service. The entire convention bulletin was written in English and Spanish, and the first reading was read out loud in Spanish. 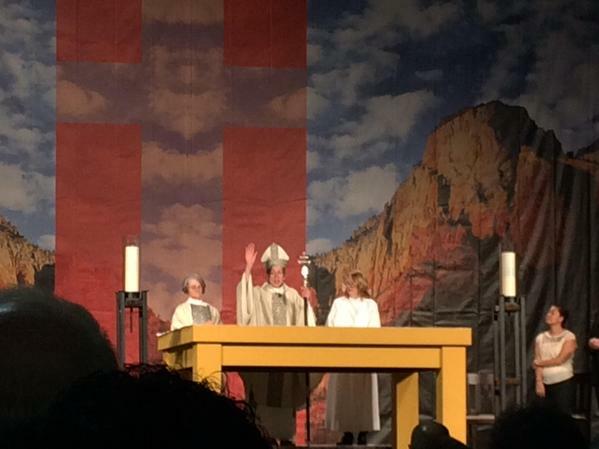 Additionally, the Presiding Bishop, read parts of the Eucharistic Prayer in English and other parts in Spanish. When she read “Por tanto te alabamos, uniendo nuestras voces con los angeles y arcangelse…” (Therefore we praise you, joining our voices with Angels and Archangels…) I got to thinking about how Isaiah wrote about the angels singing in Hebrew, John related their song in Greek, and that some might speak Spanish, as well as English. The most powerful moment for me, however, was when Presiding Bishop Katharine said, “In the languages of our hearts, as our Savior Christ has taught us, we now pray,” and I heard people saying the Lord’s Prayer in three different languages. The rhythms of the different languages, their cadences, and their predominant sounds wove together for a beautiful harmony. In heaven that harmony will be even richer, and, with the gifts of the Holy Spirit poured out upon us, we’ll be able to understand each other fully, as well. For this morning, a taste of that heavenly beauty was enough. Note, everyone can be a part of our convention worship in two ways. 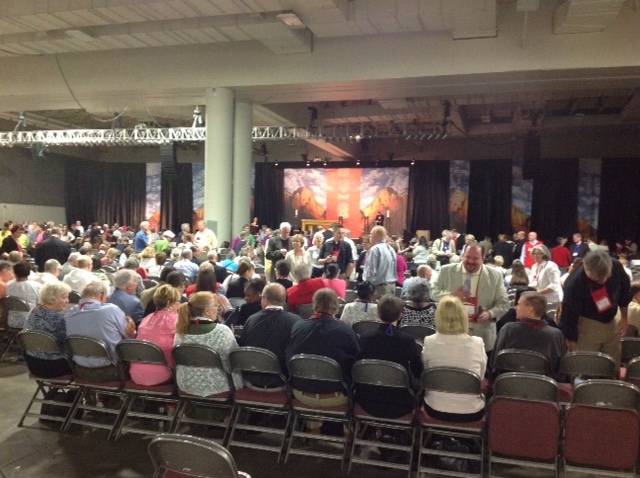 First, the convention is accepting petitions from the entire church, some of which will be read each day at worship. You can submit a petition at http://prayersofthepeople.org/. Second, the Episcopal Church Media Hub is live streaming worship and other sessions of General Convention. The Media Hub web address is http://episcopaldigitalnetwork.com/gc/. For the Worship Bulletins for all the services of General Convention go the General Convention worship page. This entry was posted in General Convention and tagged Fr. Adam, General Convention, liturgy, Spanish, Tongues, Tribes, worship. Bookmark the permalink.